When it comes to convenient snacks for life on the go, Jif now delivers much more than delicious peanut butter to keep your family going, with new Jif To Go Dippers! Dip into an all-in-one portable snack of Creamy Peanut Butter with Pretzels or Chocolate Silk Peanut Butter Spread with Pretzels. From dance lessons to summer travels, Jif To Go Dippers provides a simple and delicious solution for every snacking occasion. Jif To Go Dippers are the latest addition to the brand's Jif To Go line of convenient snack solutions which currently includes four varieties of peanut butter packaged in portable 1.5oz cups – Creamy Peanut Butter, Chocolate Silk Peanut Butter & Chocolate Flavored Spread, Natural Creamy Peanut Butter Spread and Creamy Reduced Fat Peanut Butter Spread. Jif To Go Dippers are available at grocery stores nationwide with a suggested retail price of $1.39 for an individual pack and $3.79 for a 3-pack. My family is always on the go. From running everyday errands like grocery shopping, bank trips, going out to eat, play dates, and dance lessons. Finding a mess free snack is always my number one goal. Jif To Go Dippers provides just that. They are the perfect portion of real Jif peanut butter and crispy pretzels. Jif To Go Dippers are delicious and very convenient. My oldest daughter dances Friday evening and is always picky about her snacks but with Jif To Go Dippers she no longer complains and knows exactly what she wants. They are mess free and when I'm in a rush I can grab one for my toddler and not worry about cleaning her up before rushing into an appointment. Have you ever tried packing pretzels and peanut butter in separate bags? Take it from me, it's a messy situation. Jif To Go Dippers are truly a life saver and perfect for all ages! 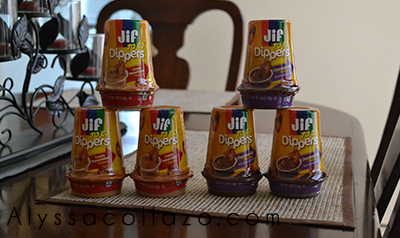 If you are a family that is always on the go, I highly recommend giving Jif To Go Dippers a try! Be sure to follow Jif on Facebook, Twitter, and Instagram. I've seen these in the stores. Now that I have read about them, I am going to try them. Thanks so much! I love peanut butter and pretzels so this is perfect. I like the idea of just being able to grab a snack while I am on the go. I love this. Usually an on-the-go snack isn't very healthy. Peanut butter and pretzels is pretty healthy, though. Yes. Great idea. I have found that I am especially loving almond and cashew butter. I wonder if they make this little to go snack in those? Yum...thanks for the share! Gotta try these soon. So easy to pack n go! These are really good. My kiddos loves them and they are definitely great for on the go. I have never seen these before! They look good though- I will have to check them out! What a perfect on the go treat for the kids. What a nice size! These are perfect for on the go! We love this kind of snack and it's perfect for our family as we're traveling a lot now. Did you say reduced fat of peanut butter cream? Now I'm really sold! I love these things. So delish! This is good to know! We usually keep the little salsa containers from mexican takeout and put peanut butter in them when we need it on the go. This is a good alternative when we're in a hurry! My son absolutely LOVES these. These are a great snack. Especially when you need a snack on the go. I like the pretzel ones. My kids love peanut butter. These dippers will be handy to keep in my purse or the car. These are awesome for the kids for snacks. I will have to get some for my nieces kids for when they come here. Thanks for sharing. We are so restricted from bring peanut butter snacks that we would not be allowed to bring them to dance. I'm o.k. with that, I've seen some have a peanut allergy reaction once and it scared me. Good for home I would think. My daughter love her some peanut butter. This would make a perfect on the go snack for her. I haven't seen these in stores around here. Hopefully we get them soon! my son loves peanut butter and would love these. Sounds like a wonderful snack for me! I love peanut butter and pretzel's. It looks very light weight and won't weigh me down.